The MPW is a production system where "the products needed are produced only when they're needed to and the quantity needed at the minimum cost." 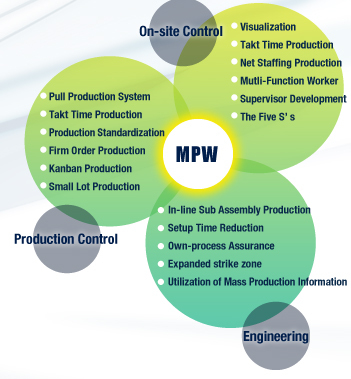 MPW activities span the three pillars of production control, engineering, and on-site control, and the system continues to be improved every year. GECOM Corp is enhancing its capabilities through the Mitsui Production Way (MPW) to achieve daily advancements to our production systems that make good-quality products without wastage.